I'm no food stylist, but I'd say this looks delicious. I am. I'm a LoFrumento. It's the family name on my mother's side, and proof positive that I am indeed an Italian-American. OK, so maybe the Italian blood has thinned out over the generations, but I can assure you that the red sauce and family culture has not. N.O.T. Decidedly not. So, um.... why the capital "F" there in the middle of 'LoFrumento? While I have many relatives both in the states and in Italy that do not capitalize the "F", the story is that my grandfather got tired of pronouncing "Lofrumento" for people, and thought that capitalizing the F might help. I don't know if it actually made difference whatsoever in man-on-the-street pronunciation, but my branch of the family all spells it like this. My grandfather's brothers and sisters and their families do not (they also all stayed Catholic when my Grandfather got into an argument with a Priest and went Methodist. That's right. I'm the only non-catholic Italian you know. Unless you know my family. Then you know about 30 of us). So. The Sauce. LoFrumento Red. My Grandmother Josephine's recipe. SO. SHE wasn't Italian, but I think when you move into a small New York apartment with your Italian immigrant Mother-In-Law, you probably become as good as one pretty quickly. I reckon. Last picture I'm ever taking of that Nasty tile counter top! Remodel begins tomorrow! YAY! You'll note that while this IS my Grandmother's recipe as given to us in the LoFrumento Family Cookbook that my dear mother put together for all the cousins when we were all about to flee the nest, I promptly lost this particular recipe the first time I made it. Only THIS recipe. The most important one of all. Unless the person I was making this for STOLE it.... That's possible. It was delicious. Always is. But somehow, I've retained the basic data in my swiss cheese brain, and while I've made a few adjustments here and there over the years, the above is the Real Deal with my own thoughts in italics. My dad says that Grams' Sauce (thinner, more orangey-looking-- probably cooked longer-- and saltier) was delicious, My mother's sauce is delicious (more robust, fresh tomatoes a lot of the time, less salt, less sugar), and my sauce is the best. Garden, go getcha'some and put that dried schtuff away like SO. OK. Here we go. And I SWEAR this will take you less than 15 minutes to throw this together. Honest. Olive Oil, meet Mr. Pan. Go ahead... get all hot and shiny. That's nice. And now, Mr. Pan, I'd like to introduce you to my friend, Chicken. He likes to be salt and peppered and gently browned on both sides.﻿ He does. He told me so. He doesn't even care if he's completely cooked through, because, you know what? He ALSO loves to be smothered in tomatoes and simmered for hours. THAT is his FAVORITE. K. While THAT's happening... start prepping the Sauce. That basically means to open those cans. Pretty much. Pile leaves. Roll leaves. Tiny slices One Way. Like SO. Tiny slices the other way. Minced! ﻿ Chicken is browned? Ok.
Pour ALL of the tomatoes into in the pan with the chicken. All of it. Then add one can of water. I don't care which of the empty cans you use. As long as you use the Sauce or the Diced/Crushed tomatoes. Those paste cans are kinda dinky. If you've already thrown the cans away, I imagine two cups of water would about approximate it. I imagine. Don't quote me on that. It doesn't really matter anyway. Just add some water to thin it a bit. It should now look like this, but perhaps a little less brown if using Red Wine Vinegar instead of Cheap Balsamic. But you MUST use some vinegar! I once tried making Sauce withOUT the vinegar, and it was.... it was.... ummmm... ketchup. I dunno... SOMETHING was seriously lacking. My husband didn't always believe that vinegar was needed so, I had him taste it once BEFORE I added the vinegar, and then AFTER. Stir it all in nicely. And if you DON'T make a mess on your stovetop, YOU'RE DOING IT WRONG! That's totally MY problem. Not yours. I hope you do better. Clean up your mess and let it simmer for HOURS, or at least until dinner time. But next time, start earlier, OK??? Miss Chicken likes to get all fall-aparty and tender-simmery in those tomatoes! Can't take the aroma of deliciousness any longer??? Are your children/husbands/wives/dogs/fish falling to their knees and begging for Cacciatore mercy? 'Cause mine were. Especially Jack-The-Dog. Seriously. Jack-The-Dog hears the first tomato can being opened, and he is literally underfoot. Laying down next to the stove WAITING. Funny thing is... he's Chow/Aussie Cattle Dog/German Shepard. Not a single Italian Hound bone in his body. Weird. I've been known to make spaghetti just.for.him. True story. Boil the water. BOIL it! Let it Roll, Baby, Roll! Add Pasta.... Casarecce today. I like to switch it up. Follow your package directions for timing, or every once in a while, throw a piece against the wall until it sticks (don't actually do this. No sense in it. Although it might be fun. If the kids aren't watching). While Signore Pasta gets all al dente, you get to grate some cheese. This is Signora Romano/Pecorino. Don't you DARE pick up a green can (or a knock-off green can) and shake it on MY PASTA. Don't you DARE! I will KNOW if that happens, and I will FIND you! Seriously, would it KILL you to buy a nice, lovely, crumbly chunk of hard Italian cheese? No. It wouldn't. And you'd be SO MUCH HAPPIER! Drain Pasta. Lean into the steam and get a facial. Don't drain it TOO much,though. Leave a little of that water in there. It's good stuff, that pasta water. Pour Signore Pasta Back into the Pasta Pot. This is important: Ladle some of the now fully simmered and happy sauce onto the drained pasta. What? You don't want to clean pasta sauce out of TWO pots? It's really better this way. Plate the noodles, and ladle MORE sauce on.... make sure your get a few pieces of now falling-aparty chicken on top. Yeah. That's the stuff. Sprinkle with the cheese you grated (put.the.green.can.away.). 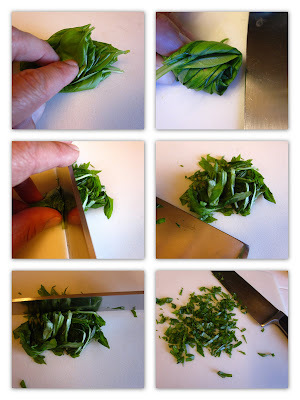 You might also want to sprinkle more fresh Basil if you are going to take pictures. *Funny story.... on my Grandmother's last visit to my house in California, she made her red sauce, as per usual. I happened to come into the kitchen just as she was POURING large amounts of salt into the sauce straight from the Morton's Salt canister. Like, just standing there, SHAKING IT IN. I mean LOADS. Enough for me to stop biting my "good-girl-who-am-I-to-tell-YOU-what-to-do" tongue and say "Grams! That's enough!" It was the saltiest sauce I think she ever made. Those are the funniest Grams' kitchen stories that I know. At least that happened in MY kitchen, anyway. And now I feel guilty for even mentioning them. Sorry, Grams.... Good thing she had a sense of humor. "Yummmm.....slobber.....yummmm....lip smack" (Takes drool of chin with hem of shirt before typing) Er, sorry, just licking my screen! WOw that looks so nice, not what I need to see when it's not near lunchtime! !